In order to connect sonar maven plugin and/or sonar eclipse plugin to the local sonar server (for example in windows PC), you need to install the sonar server. Download and unpack the sonar server zip file from here. Either create a new sonar profile by importing all rules files – (a) Edit configuration given in top right web page: Configuration-> Create . Enter a profile name and select Checkstyle, Findbugs and PMD configuration files. Or restore the configuration from a backup – Configuration->System->Backup->Restore configuration. Paste “http://dist.sonar-ide.codehaus.org/eclipse/“ into the field named “Work with:” and press Enter. 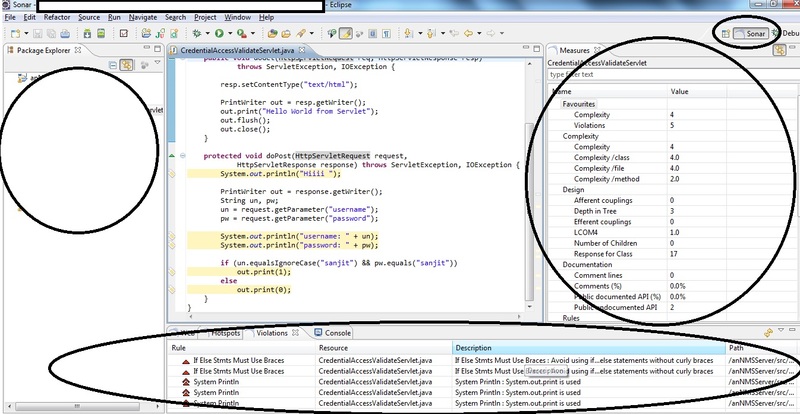 Select: “Sonar Integration for Eclipse..
Click Next. Eclipse will then check to see if there are any issues which would prevent a successful installation. Once the installation process is finished, Eclipse will ask you if you want to restart the IDE. It’s strongly recommended that you restart IDE. Check if Sonar server lists shows a link like http://localhost:9000. If it doesn’t then add the link as New Sonar Server Connection > Sonar Server URL. (b) Download “clover.licence” file from here. This is a FREE TRIAL VERSION and it is valid for only 30 days. (c) Edit the pom.xml of the maven project to include the below for which you need to run the sonar. Edit proper “licenceLocation” field. 4. Running the Maven project for analysing the code through Sonar. You are now all done with configuration and can start using Sonar Eclipse. Change your eclipse perspective to “Sonar”. Hi, I was wondering if I could have the source code of this demonstration ? I wrote it 3 yrs back. Unfortunately, I don’t have the code base with me now. It was a simple java project, nothing special. You could try setting up, by following the steps in the post, with your own project and if you face any issues, do comment here and I’ll try to help you out. How to export the complete report all projects in excel/CSV from Sonar-server ? If you are looking for Sonar plugins for the job, then please google it out. You will find many commercial/open source ones. But there are webservice java client API exposed by Sonar platform which will very well do this job and is much more flexible as you have the complete control of what you want to extract. Hi Abdul, you should look at the “sonar.log” file located under the “logs” sonar installation directory. It should show you the cause of the startup failure. If not, then I would suggest you to increase the logging level to “DEBUG” for “wrapper.logfile.loglevel” key in “wrapper.conf” file located under the “conf” sonar installation directory and then restart sonar. Check the “sonar.log” file. Hope it helps! Eclipse asking username & password, while installing sonar plugin from eclipse. I have given as admin/admin, but same is not accepted. Please suggest. Are you trying to install the plugin behind firewall? I mean like from your office network? If so, then you need to configure network settings in your eclipse preference & provide your network username & password there. Only then your plugin should get installed. Do let me know if that is not the case?